In just a few years, visitors will stand atop an 80-foot-tall hill on Governors Island and enjoy sweeping vistas of New York Harbor, the Statue of Liberty, and the Manhattan skyline. 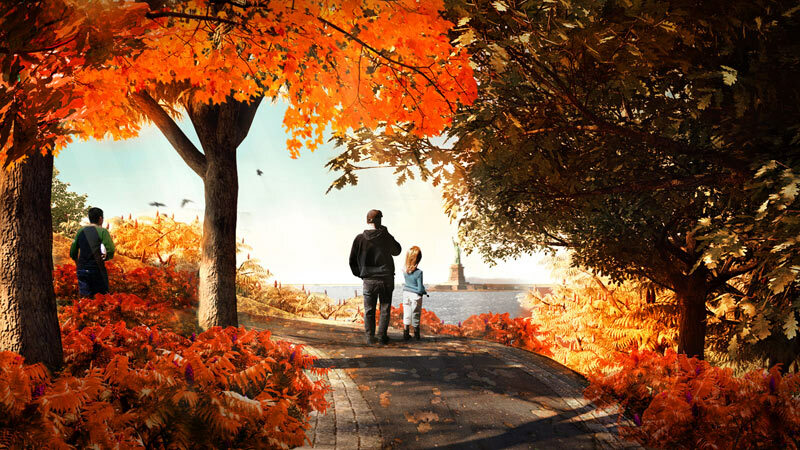 Today Mayor Bloomberg broke ground on The Hills, a new 11-acre stretch of green space, that is part of Governors Island Park, and one feature of landscape architecture firm West 8’s expansive 30-acre Public Space Master Plan that was first unveiled in 2010. The Hills will, as its name so clearly suggests, will consist of a series of rolling hills: a 25-foot-tall hill offering views of of the island and city skyline; a 40-foot hill, dubbed Slide Hill, featuring 4 slides; a 60-foot hill called Discovery Hill that will exhibit site-specific art installations; and lastly, Outlook Hill, peaking at 80-ft and providing 360-degree panoramic views of New York City. The sloping park will be made of debris from old parking lots and from the recent demolition of the island’s vacant coast guard apartment buildings. These materials will be recycled and turned into fill that will form the center of the Hills. Bloomberg also announced Eric and Wendy Schmidt’s donation of $15 million to the construction of the Hills, which marks the official launch of the Trust for Governors Island’s capital campaign to raise a total of $70 million. So far the campaign has raised $36 million from a number of private donors including The Lauder Foundation, Joan H. Tisch and Family, and the Tiffany & Co Foundation. Construction commenced on the new 30-acre park in May 2012, and several sections—including Hammock Grove, Play Lawn, and Liggett Terrace—are slated to be completed by this year.